in this post and hope this will be useful for you. everything – you need to have some pictures, graphics on your ebook – especially the cover. You can always hire a designed on a freelance website to design an ebook’s cover and inner pages for you. Also make sure to hire proof reader (if you’re not a native language speaker) – to spell out all the grammar mistakes. Once you have everything done all you need to do is just to compile your ebook into a pdf file – which is the most popular format for ebooks today. Again, if you don’t know how to do this, there are always many people that can help you. *The next priority is the issue of marketing the product. Now the eBook is ready, a proper design is needed for the website to market the product to the intended buyers. You need to write a sales pitch page that would sell your product. There are professional people who write such pages, so you can always hire one on a freelancers website. A properly designed website and great sales page will convert your visitors into buyers and it will result you in many sales. * Once you have that ready, just get a domain name under a web hosting company. And you will have a fully working website. * Now you have a working website and a great ebook – how to accept payments? You will have to find a payment processor that will accept your product and allow you to process payments online – accept credit card and Paypal payments online. One of such companies is Click2Sell that allows you to sell your digital products online and accept credit card payments from your customers. Proper payment methods will let your buyers pay for your ebook easily and definitely attract the buyers for easy and convenient shopping. * Then once you have everything ready and set up all you will have to do is just to go and start promoting your website. 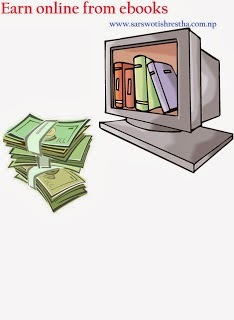 There are many ways to promote your ebooks website online – use available affiliate networks where you will pay affiliates to promote your ebook and this way you will earn money. Write articles, build links to your website. Submit your website to relevant website directories. This will attract interested visitors and you will start selling your ebook. On successful completion of all the above steps, you can rest assured that your business would flourish and you would be making money. Thus, if you have some information which can be sold online, you can simply transform them into digital information and can have a profitable business. It’s not an easy task to write an ebook, however there is no free money – even online and there is no magic bullet. You have to work hard with a right plan and only then you will succeed. However, once you succeed and start making your first sales you will be happy that you started this online business.